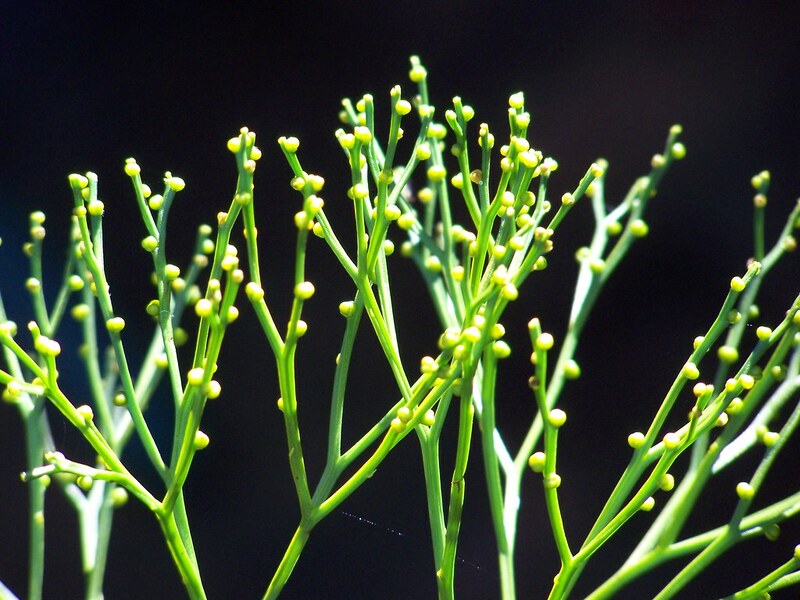 Development of stomata in Psilotum nudum (L.) Beauv. Epidermal structure of Psilotales and stomatal ontogeny of Tmesipteris tannensis Bernh. Mature epidermis and cuticles of the two genera of Pailotales, viz. Psilotum nudum and Tmesipteris tannensis and the stomatal ontogeny of the latter are described. FIG. 7. Stomatal complex with epicuticular wax; the cuticular surface of epidermal surface is smooth. Bar 5 20 mm. FIG. 8. Stomatal complex with epicuticular wax concealing pore. Bar 5 20 mm. FIG. 9. Epicuticular wax composed of a network of fibers. Bar 5 1 mm. FIG. 10. Developing axis with differentiating vascular bundles and chlorenchyma. Undulate walls of chlorenchyma cells shown at arrow labeled U. Bar 5 100 mm. FIG. 11. Paradermal section of a lateral branch with mature chlorenchyma and with stomata arranged in the hollow longitudinal ribs. Undulate walls of chlorenchyma cells shown at arrow labeled U. Bar 5 100 mm. Apical regions of developing aerial shoots of Psilotum nudum (L.) Beauv. were studied using both scanning electron microscopy (SEM) and light microscopy (LM) with the aim of improving our understanding of early stages in stomatal and epidermal ontogenesis. SEM samples were fixed in gluteraldehyde, critical point dried, and coated with an Au-Pd alloy. LM samples were fixed in FAA and embedded in paraffin. LM sections were stained with 0.05% toluidine blue for protein. SEM shows that P. nudum stomata develop from 20 mm-long domed meristemoid cells into guard cell mother cells (GMCs). A furrow dividing guard cells develops at 30 mm long, and wax deposition that will cover the entire cell begins at 70 mm long. LM longitudinal sections of GMCs show a cytoplasmic protein net that organizes into radial fibers, similar to reports of actin fibers in stomata of angiosperms. This study provides additional details of stomatal development in Psilotum and is the first report of an actin-like protein net in Psilotum. in Z. für Bot. 19: 129-170. Untersuchung der Entwicklung der Epidermis des Psilotinae und des Filicinae-Blattes und der Entwicklung der Stomas. in Acta Biol (Szeged), Ⅶ (3, 4):43-67. SEM shows that P. nudum stomata develop from 20 mm-long domed meristemoid cells into guard cell mother cells (GMCs). A furrow dividing guard cells develops at 30 mm long, and wax deposition that will cover the entire cell begins at 70 mm long. LM longitudinal sections of GMCs show a cytoplasmic protein net that organizes into radial fibers, similar to reports of actin fibers in stomata of angiosperms.